M151A2 Steering Wheel. These are NOS M151A1 Wheels that we have modified so that they work with your M151A2 jeep. 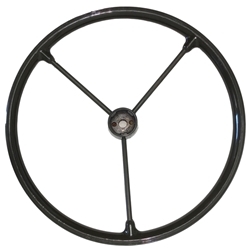 Original A2 steering wheels have become extremely hard to find and quite expensive if you do. So AJP has modified the A1 steering wheels so they are a direct bolt on to your A2. They look and work fantastic plus a great price!